CULVER CITY, California -- Glance around the "Jeopardy!" set during rehearsals for its first-ever team championship and it's easy to be intimidated by the assembled brain power. There's Brad Rutter, whose overall "Jeopardy!" haul, $4.3 million, is the most won on any game show. And Ken Jennings, a 74-game winner and top moneymaker, with $2.5 million, in non-tournament "Jeopardy!" competition. And Buzzy Cohen, the reigning Tournament of Champions winner. They're among the six captains who will join their teams in competing for a top $1 million prize in a series of 10 episodes that begin airing Wednesday and conclude March 5. The other three captains: Julia Collins, No. 2 in overall winnings on the show; Colby Burnett, a Teachers Tournament and Tournament of Champions victor, and Austin Rogers, No. 5 in games and money won. "It's like the Mount Rushmore of 'Jeopardy!'" observed Jimmy McGuire, part of the traveling "clue crew" that poses video answers from distant spots. Can "Jeopardy!" soloists work together? "We're going to find out," Trebek said. The captains, who will also play, built their three-person teams from among the remaining 12 contestants. 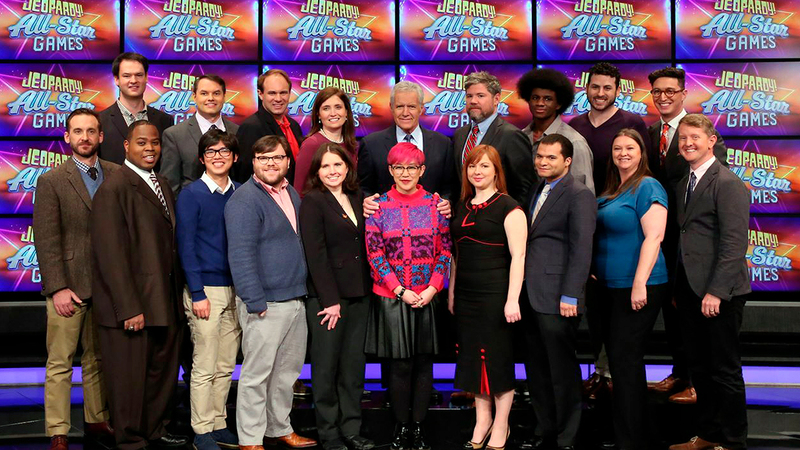 The full teams won't play directly against each other, with one person from each team designated to compete in a game's first round, another to play double "Jeopardy!" and the third to play the final round. Players are working hard for the money, in the strategy sessions held at the beginning of each game and, more importantly, in the cramming that Friedman metaphorically termed "test prep on steroids." Exhibit A - as in type A - is Cohen, who created mental and physical training drills to prepare for his previous "Jeopardy!" appearances and resumed them for the tournament with teammates Alex Jacob and Jennifer Giles. "I would go the gym, hang from a bar and have my trainer quiz me to try to recreate the stress" of being in the thick of the game, Cohen said. This time around, he added NFL reaction-time drills - to sharpen his skills with the buzzer that gives players a chance to score - along with "deep secrets" he gleaned from Jacob. Rogers, whose team includes Roger Craig and Leonard Cooper ("I drafted up," Rogers said of his picks, both educated and working in the sciences) said he's so comfortable on the "Jeopardy!" set that it feels like home. But he admits to some anxiety. "I do not care if I fail. But if I fail other people on something that I should know, that I should have memorized ... like a world capital or an Oscar year, and I'm letting someone else down, that's not cool," he said. Collins said she enjoyed taking a cooperative approach to a game that's typically an individual experience, beyond splitting the workload. "It is very solitary to be on the show in the normal format and compete alone, which is what you'd expect. But you go through the whole experience of the show by yourself, so it's nice to have your teammates who are sharing that experience with you," she said. Burnett, who picked Pam Mueller and Alan Lin for his team, was eager to compete but said his work as a college counselor came first. "Even if I were to win the grand prize, it's not as if I would or could retire. But I'm putting my best foot forward," he said. There's something else unprecedented besides the team format, producer Friedman said. "We do a nice little opening interview piece at the beginning of the first episode with the six captains, and you'll see some fun, good-natured trash talk," Friedman said. "Look at them," he said playfully. "It's not fair to beat up on nerds."